Our pipe rehabilitation crews can rehabilitate pipelines from 2″ to 18″ in diameter in less than a day with minimal disturbance to your home, business, or facility. Cured-in-place-pipe can negotiate 22 degrees, 45 degrees and most hard 90 degree bends with ease. The existing host pipeline is cleaned out with a high pressure water jetter and a video pipe inspection confirms weather or not the pipe is able to be repaired with cured-in-place pipe. A piece of needle-punched Polyurethane (PU) or Polyprolelyne (PP) coated felt liner is saturated with a polyester or epoxy resin and then inverted via air pressure into the pipe and then expanded with air, water, or steam. The lining is then cured in place as the hot water or steam cooks the resin. After the curing process another video pipe inspection is performed to inspect the results and to ensure a proper installation.Once installed, our permanent new pipe liner will last a minimum of 50 years. This proven process of pipe repair is superior to traditional digging, which risks damage to other underground utilities and restoration of ground surfaces and hardscapes. The process can save utilities owners up to 75% of the cost associated with traditional open-cut repair methods. No-dig pipe lining is the fastest and safest method of pipe repair thanks to the ability to eliminate digging. It also reduces the carbon footprint it takes to repair your sewer line, AND it can be done in 1 DAY. First, you need a camera inspection. Before any pipe lining project, the pipe in question must be properly inspected to properly asses the condition of the pipe. The camera inspection is the first, most important step to repairing your sewer line. Our pipe inspection service provides a video of the existing condition of the line, the approximate length, and will show any trouble we might have with installing the CIPP. After the sewer inspection, the pipe will be cleaned from all debris and roots by using our drain cleaner or hydrojetter. 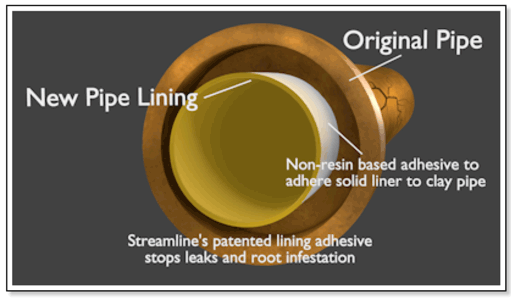 The existing line will need to be free of any debris or roots to provide a smooth surface for the liner to adhere to. Once the line is completely cleaned and repaired, the liner is ready to be installed. The CIPP liner is inverted using air or water into the existing line. Once installed the liner is inflated with a calibration tube using water, steam, or air until the liner hardens, in most cases about 3 hours. After the line is fully cured out, the calibration tube is removed and the brand new CIPP, pipe within a pipe remains. The CIPP provides a structural repair for broken, cracked, or missing pipe sections and eliminates future root intrusion. Guaranteed manufacturer’s warranty for 50 years! Finally, after the cured-in-place pipe is installed, the post camera inspection is performed. This will ensure the liner was installed properly and will be provided at the end of the job. All SLB Pipe Solutions employees are certified installers of Perma-Liner Industries materials. Each technician has passed a 3 day manufacturer’s training course ensuring quality workmanship. All of our lining products are NSF, IAMPO, & ICC-PMG approved. All of our products are widely accepted by the international and residential plumbing code.